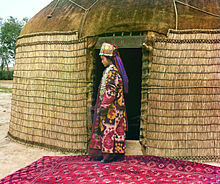 ^ The modern Turkish, Turkmen and Azerbaijani languages are all Oghuz languages. ^ Omeljan Pritsak, "Uzes", in Alexander P. Kazhdan, ed., The Oxford Dictionary of Byzantium (Oxford University Press, 1991). ^ Elizabeth A. Zachariadou, "Turkomans", in Alexander P. Kazhdan, ed., The Oxford Dictionary of Byzantium (Oxford University Press, 1991). ^ a b Nicolle, David; Angus Mcbride (1990). Attila and the Nomad Hordes. Osprey Publishing. pp. 46–47. ISBN 0-85045-996-6. ^ Torday, L., Mounted Archers: The Beginnings of Central Asian History. The Durham Academic Press, 1997, pp. 220–221. ^ Shiji, c. 90 BC: 110. ^ Faruk Sümer, Oğuzlar (2007). TDV Islam Ansiklopedisi (PDF) (in Turkish). 33. pp. 325–330. ^ "Oguz". Encyclopædia Britannica Online. ^ C. E. Bosworth, The Ghaznavids:994–1040, (Edinburgh University Press, 1963), 216. ^ "yuruk". Webster's Third New International Dictionary, Unabridged. Merriam-Webster. 2002. Chisholm, Hugh, ed. (1911). "Macedonia § Races" . Encyclopædia Britannica. 17 (11th ed.). Cambridge University Press. p. 217. Wikimedia Commons has media related to Oghuz Turks.